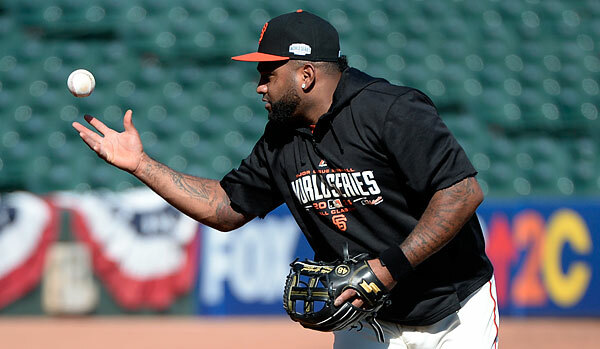 OCTOBER 24 – SAN FRANCISCO: Pablo Sandoval #48 of the San Francisco Giants bobbles a ball during batting practice prior to Game Three of the 2014 World Series at A,T & T Park on October 24, 2014. (Photo by Ron Vesely/MLB Photos). 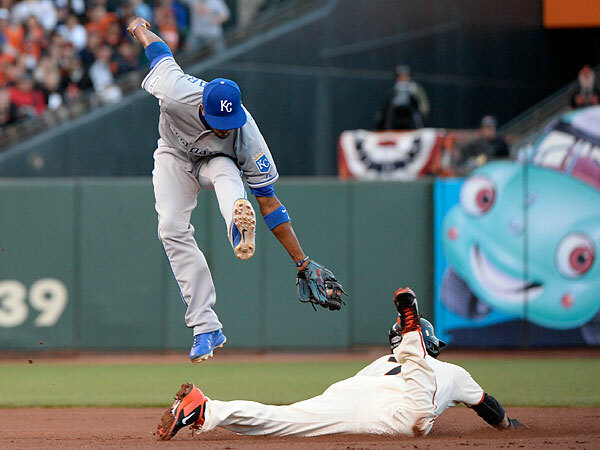 The Giants made that a certainty with a resounding comeback against the Kansas City Royals in Game Four of the 2014 World Series. But since this is a recap of Games Three AND Four, I’ll start my recap with Game Three. Makes sense, right? 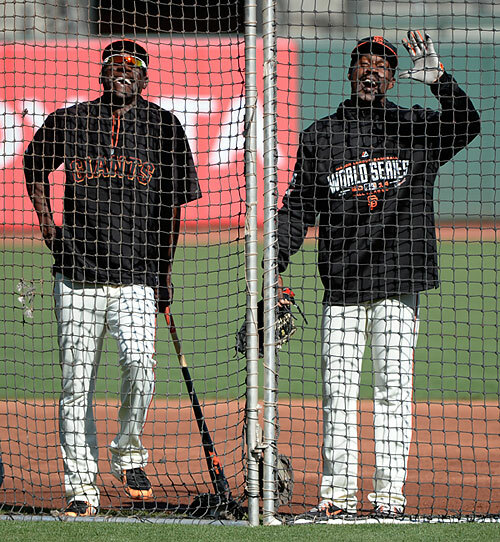 OCTOBER 24 – SAN FRANCISCO: Coaches Roberto Kelly #39 (L) and Shawn Dunston of the San Francisco Giants share a laugh while bantering with the Royals during batting practice prior to Game Three of the 2014 World Series at A,T & T Park on October 24, 2014. (Photo by Ron Vesely/MLB Photos). Opening ceremonies at A,T and T Park were held under beautiful, sunny skies in that wonderful City by the Bay. Well, beautiful if you didn’t have to shoot under those conditions! Dark shadows and a bright background made shooting pre game ceremonies a challenge. While my Nikon SB on camera flash is excellent, it just can’t quite throw the amount of light I’d like from a distance. Not ideal, but I made it work. 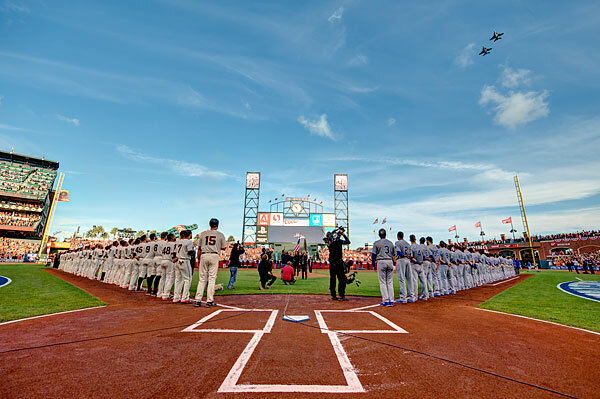 OCTOBER 24 – SAN FRANCISCO: Two F-16 fighter jets fly overhead during the National Anthem prior to Game Three of the 2014 World Series at A,T & T Park on October 24, 2014. This photo was modified in HDR software. (Photo by Ron Vesely/MLB Photos). 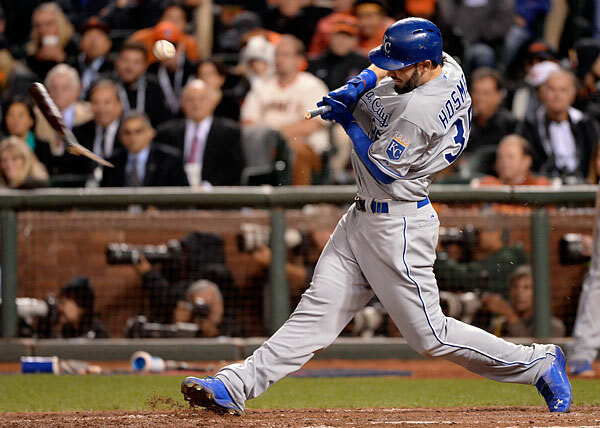 OCTOBER 24 – SAN FRANCISCO: Eric Hosmer #35 of the Kansas City Royals shatters his bat during Game Three of the 2014 World Series versus the San Francisco Giants at A,T & T Park on October 24, 2014. (Photo by Ron Vesely/MLB Photos). As for the game? Game Three might have been fun for a baseball purist, but as far as photos go, it was lacking. We all like dives, collisions (rare any longer due to the new rule changes), errors… you know… ACTION! 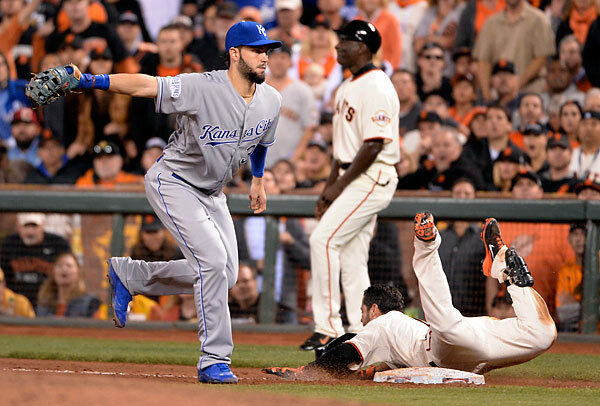 OCTOBER 24 – SAN FRANCISCO: Eric Hosmer #35 of the Kansas City Royals makes the putout at first base as Gregor Blanco #7 of the San Francisco Giants slides late head first into first base in the eight inning during Game Three of the 2014 World Series versus the San Francisco Giants at A,T & T Park on October 24, 2014. (Photo by Ron Vesely/MLB Photos). Not this night. The Royals hung on to win Game Three 3-2 to take a 2 games to 1 lead in this best of seven Series. Game Four’s weather forecast included a chance of rain during the evening and unfortunately, the forecasters were right. Not enough rain to stop the game, but enough to be what I call “nuisance showers”. Rain cover on, rain cover off… Hey, it sure could have been worse! 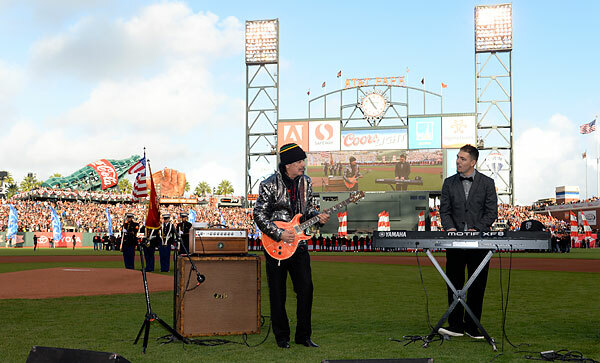 OCTOBER 25 – SAN FRANCISCO: Carlos Santana and son Salvador perform the National Anthem prior to Game Four of the 2014 World Series versus the San Francisco Giants at A,T & T Park on October 25, 2014. (Photo by Ron Vesely/MLB Photos). Being on the field during pre game occasionally gives me the opportunity to photograph some cool moments and people and prior to Game Four I had a chance to photograph, listen to and enjoy the National Anthem as played by none other than San Francisco native and rock guitarist icon Carlos Santana. 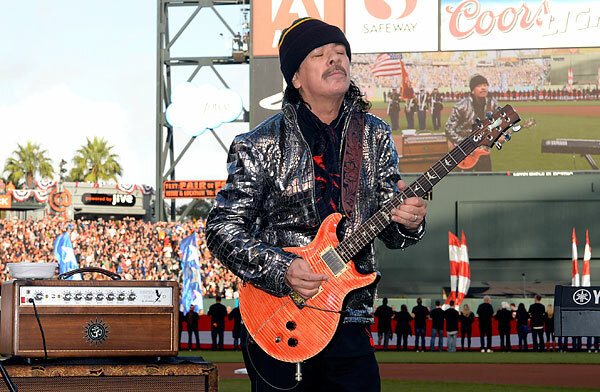 OCTOBER 25 – SAN FRANCISCO: Rock icon Carlos Santana performs the National Anthem prior to Game Four of the 2014 World Series versus the San Francisco Giants at A,T & T Park on October 25, 2014. (Photo by Ron Vesely/MLB Photos). Being a bass player myself, I found myself checking out his gear (he’s a PRS player for all you guitar players out there.. he had three tuned and ready to go). Loud, dirty, awesome. He was joined on keyboard by his son Salvador. One of those little “perks” of the job. OCTOBER 25 – SAN FRANCISCO: Gregor Blanco #7 of the San Francisco Giants steals second base in the first inning of Game Four of the 2014 World Series versus the San Francisco Giants at A,T & T Park on October 25, 2014. Blanco eventually scored. (Photo by Ron Vesely/MLB Photos). I shot Game Four from the outside first photo well, just beyond first base past the Royals dugout. Again, cramped conditions made swinging cameras quickly from home to the outfield a challenge, but I like challenges! Hah! The Giants jumped out to a quick 1 run lead without the aid of a hit in the first inning but the Royals quieted the Giants faithful with a 4 run third and it sure seemed like we might possibly end the Series in San Francisco. A,T & T Park was so quiet it was erie. OCTOBER 25 – SAN FRANCISCO: Eric Hosmer #35 of the Kansas City Royals reaches first base safely after beating pitcher Ryan Vogelsong #32 of the San Francisco Giants to the bag during the third inning Game Four of the 2014 World Series versus the San Francisco Giants at A,T & T Park on October 25, 2014. (Photo by Ron Vesely/MLB Photos). The Royals seemed to be in total control and with their vaunted and up to this point seemingly invincible bullpen ready to go, things didn’t look good for the orange and black faithful. 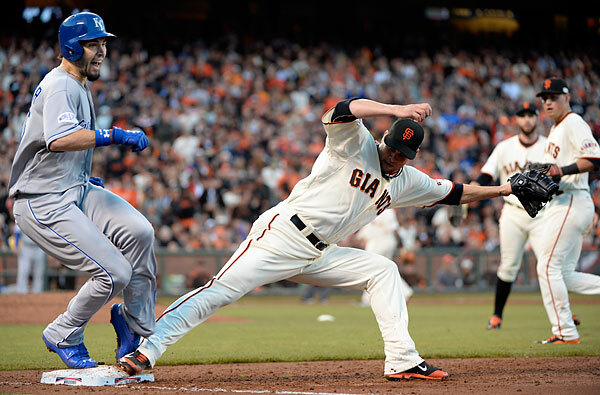 The Giants, however, chipped away and tied the score as the ballpark started to come back to life along with the Giants. 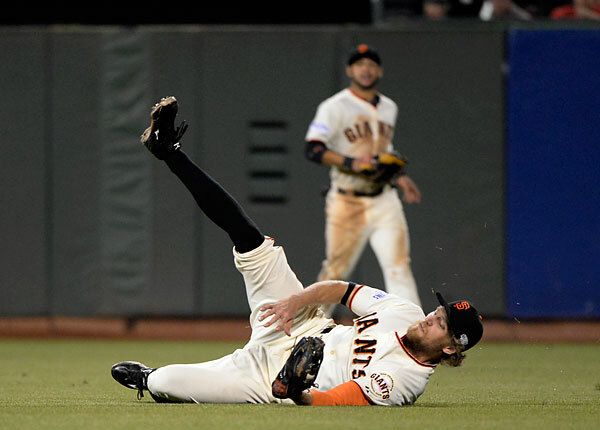 OCTOBER 25 – SAN FRANCISCO: Hunter Pence# 8 of the San Francisco Giants makes a diving catch in the ninth inning of Game Four of the 2014 World Series versus the San Francisco Giants at A,T & T Park on October 25, 2014. (Photo by Ron Vesely/MLB Photos). Then, with two outs and the score tied in the sixth, the “Panda”, Pablo Sandoval, delivered a clutch two run single to give the Giants the lead. 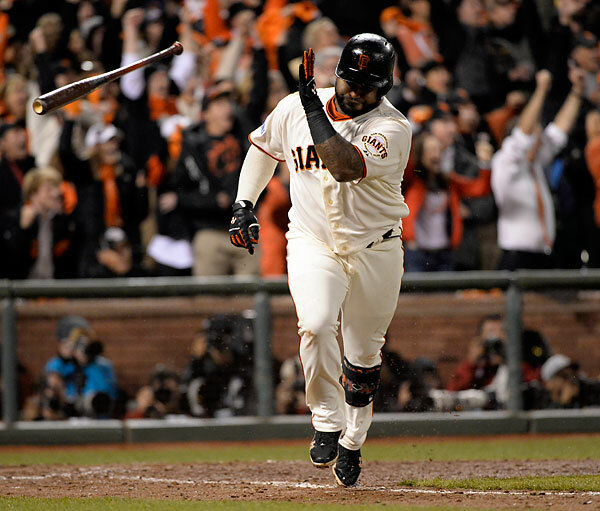 OCTOBER 25 – SAN FRANCISCO: Pablo Sandoval #48 of the San Francisco Giants flips his bat after hitting a clutch, two-run single with two out in the sixth inning to give the Giants the lead during Game Four of the 2014 World Series versus the San Francisco Giants at A,T & T Park on October 25, 2014. (Photo by Ron Vesely/MLB Photos). They busted the game wide open with a 4 run seventh and after scoring 10 unanswered runs, the Giants made the game a route. Looking back at around the third inning, I’m sure many baseball fans didn’t see that coming. Especially fans wearing the royal blue. OCTOBER 25 – SAN FRANCISCO: Pitcher Tim Collins #55 of the Kansas City Royals reacts after throwing the ball away after fielding a bunt hit by Gregor Blanco in the seventh inning of Game Four of the 2014 World Series versus the San Francisco Giants at A,T & T Park on October 25, 2014. (Photo by Ron Vesely/MLB Photos). Tonight is Game Five and then our MLB Photos crew will board a charter and head back to Kansas City for a potential Series ending sixth game Tuesday night in Kaufmann Stadium, where it should be rockin’ for sure. This entry was posted on Sunday, October 26th, 2014 at 2:26 PM	and is filed under Assignments. You can follow any responses to this entry through the RSS 2.0 feed.